Her aged and milky brown eyes traced the lines traveling along my right palm, her fingers gently tracing the life I’ve held there. Finally, finished reading the secrets held in my hand, my aunt let go of my hand and looked into my eyes and spoke to me in a voice stronger than it had been in days. My family’s 91-year old matriarch — with secrets of her own — began by reminding me of the many times I would allow other’s talents and successes be celebrated before my own. “You are so silly,” she said. She gave me an example with a wave of her hand, painting the scene around us. “Look,” my aunt told me, and I looked at myself working hard in my classroom. “Do you see yourself there? You were younger then,” she laughed. Yes, thank you for reminding me, Tia. “But you were silly,” Tia shook her head at me, frowning. “You thought other people were… how do you say it?” she looked at my cousin. Her English breaks when she becomes more animated, but I begin to understand what she is trying to tell me. Mí tia explains how I believed that people were more smart or experienced than I was and so my successes could not compare to theirs. My eyes begin to tear up without me even realizing it. My aunt is one of three remaining sisters left in what was once a large Catholic family. It is just my aunt, one aunt who still lives in Lima, Peru and my mother. These three women, along with assorted and scattered cousins, are all who are left of my enigmatic Spanish ancestry. They are the last living connections to mysterious roots that stretch deep into an unknown. At 91-years old, my beautiful aunt still has the same bright white hair she had when I first started visiting her every summer as a 10-year old. She has been lying about her age since she was 60, and lying about our heritage even longer than that. All the women who live these branches of my family tree are glamorously beautiful, photographs of their youth witness of this truth. Their Spanish dark hair and eyes, impeccable makeup with penciled in eyebrows and perfectly done French twisted hair. I pity the three older brothers who must have gone to bed each night worrying over all their sisters, keeping baseball bats nearby to threaten suitors at the door. My cousin hands my aunt her oxygen and pats her arm. My son is taking notes nearby and I smile at him. He knows what we all know, that being sensitive can be exhausting. He is one of us. My aunt sees it in him just as she saw it in me once. Just as brown hair or the shape of our eyes can run down the veins of our tree, so can The Gift. We can all feel, all see. 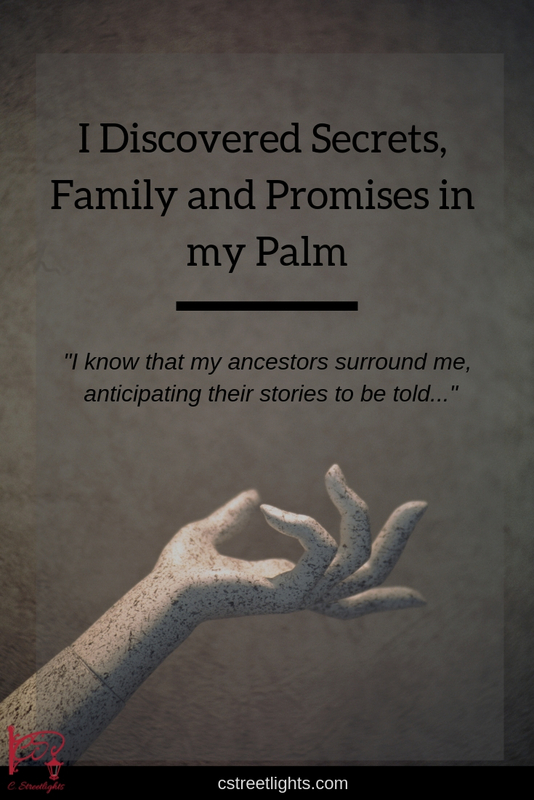 I never knew until then my aunt had the gift of palm reading. “I see your future. It is all going up. You are succeeding. So strong. So, so, so strong.” She is tired now. Her energy became a part of mine and I can feel it in me; her sacrifice overwhelms me and I cherish it. She pulled up her strength to give to me, to remind me of my strength and I see her now, the shadows under her eyes and the paleness in her cheeks. My tia. I look over at my cousin. “I’m so glad you felt inspired to come today,” she tells me and I nod. It was inspired. My aunt wants us to come again soon after she rests from talking so much. She is remembering more from her youth and is ready to share her stories. My son and I are the ones she has chosen to give the truth to. Mysteries will soon slowly be uncovered while I’m sure new mysteries will develop. I am beginning to understand what has made me who I am in this family. I also understand what has helped me survive. 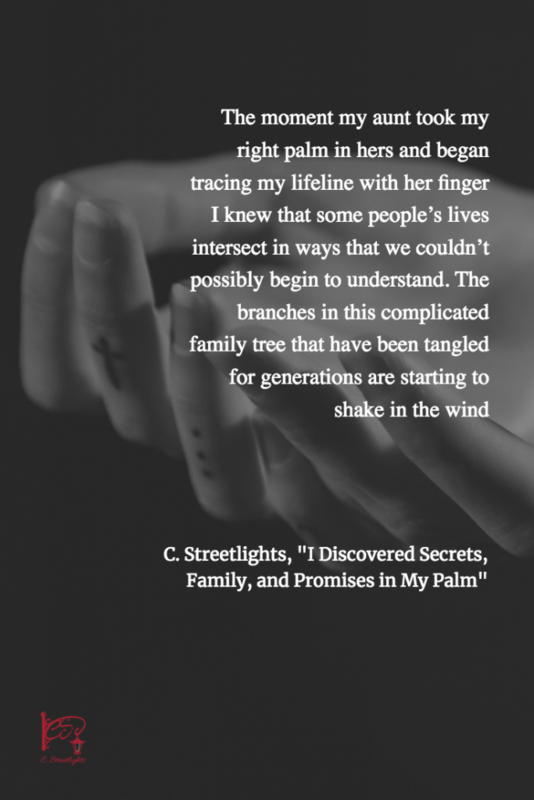 The moment my aunt took my right palm in hers and began tracing my lifeline with her finger I knew that some people’s lives intersect in ways that we couldn’t possibly begin to understand. The branches in this complicated family tree that have been tangled for generations are starting to shake in the wind; I can feel them beginning to loosen and wounded knots begin to heal. I know that my ancestors surround me, anticipating their stories to be told so that broken hearts can be mended and names can be spoken out loud again. From my palm’s lifeline to theirs in the afterlife, our palms touch and we are healed. It is time for us to know one another and become acquainted once more so that we might all be real to each other. And so that my aunt can know she chose the right palm. *Originally featured as a guest post for Rachel Thompson.